Chalice with ostrich egg, 19th century. 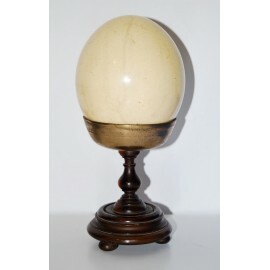 > DECORATIVE AND COLLECTIBLE ITEMS>Chalice with ostrich egg, 19th century. Turned wood chalice with three rounded feet and bronze chalice holding on ostrich egg, late 19th century. MEASUREMENTS: 27 x 13,5 cm.